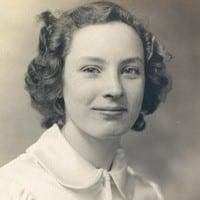 Virginia P. Beaverson, age 97, of Bryan, Ohio, died at 9:12 A.M. on Wednesday, March 27, 2019, at Community Health Professionals Inpatient Hospice in Defiance, Ohio, after a brief illness. Mrs. Beaverson was a graduate of Stryker High School, where she played the drums and basketball. Virginia loved her family and friends, doing crafts, playing cards and bingo, music, caring for flowers and plants, and spending time with her special friend, Maurice Degryse. Virgina P. Beaverson was born on December 22, 1921, in Stryker, Ohio, the daughter of Harley and Mabel (Geesey) Gentit. She married her husband, Stanley Beaverson, on July 31, 1940, and he preceded her in death on November 22, 1978. Surviving are two daughters, Marilyn (Artch) VanScoder, of Bryan, Ohio, and Cindy (Michael) Joyner, of Fort Wayne, Indiana; 14 grandchildren; 27 great-grandchildren; 10 great-great-grandchildren; a daughter-in-law, Betsy Beaverson, of Oconto, Wisconsin; and a sister, Jean Beattie, of Toledo, Ohio. Preceding her in death in addition to her husband were her parents; a daughter, Patricia Beaverson, in 2011; a son, Phillip Beaverson, in 2007; two brothers, Donald and Max Gentit; a grandchild, Jonathon Slattery; and a very special friend, Maurice Degryse. A memorial service will be held on Saturday, March 30, 2019, at 1:00 P.M. at the Krill Funeral Home, Bryan, with Pastor John MacFarlane officiating. The family will receive visitors prior to the service beginning at 11:00 A.M. Interment will be in Lauber Hill Cemetery following the service. Memorials are requested to Community Health Professional Inpatient Hospice. Virginia’s family would like to thank the staff at Fountain Park, Fulcare and CHP Hospice for the special care and treatment of Virginia throughout the last few years. It is deeply appreciated and will never be forgotten. Be the first to comment on "Virginia Beaverson (1921-2019)"